Adam Johnson read of rules and bats, and won the balloon debate as a can of Van Camp's Pork and Beans. Stephanie Harrell read of cats and breasts, from her magnum opus in progress “The Beige Berets.” Robin Coste Lewis delivered some very pregnant poems while also being very pregnant. Stan Goldberg illuminated us with his forthcoming “Leaning Into Sharp Points,” a true story of spiritual growth through hospice work. 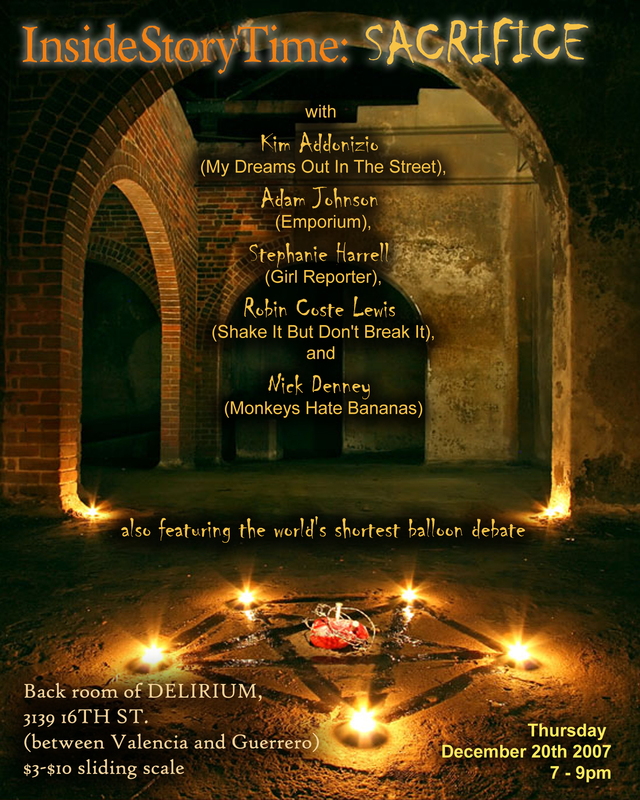 Nick Denney read his epistemological tour de force “Monkeys Hate Bananas.” Absent alas was Kim Addonizio who called in sick, but did send in a poem from the point of view of Allen Ginsberg, who was present in spirit, demanding not to be thrown out of the balloon.